Thank you for your latest lovely blog post on Summer Flowers for Summer Heat. I know you feel the heat in Oklahoma much more than we do here in Indiana. But we are gardeners and somehow we make the best of it, don't we? Whether it is too much rain, as is my good-to-have problem this year or not enough rain, which we wouldn't wish on our worst enemies, we figure out what will grow for us, don't we? Speaking of growing, I always think of you when I look at all the day lilies in my garden. I've added a picture of one here, and now that I see it, I can't believe I didn't deadhead those two spent blooms before I snapped the picture. My sloppy gardening habits, forever memorialized in that photo. And roses? Dee, I know how you've struggled with all the beautiful roses you planted in your garden, now that the dreaded rose rosette disease is in your area. I admire you, though, for helping to spread the word about this rose disease through your blog and other venues, and then setting a good example of digging up diseased roses and replanting with flowering shrubs and native plants. Have I told you how proud I am of you for writing the book The 20-30 Something Garden Guide? It is important to teach future generations how to "grow stuff", whether it is day lilies, roses, native plantings, or one of my favorites, vegetables. Your book is a great gift for new homeowners and newlyweds. I've given it to all my nieces and nephews who have their own homes and a place to garden. And as the others grow up, they'll get copies from me, too. I'm not sure any of them are gardening much, yet, but I'll keep poking them a bit. I will see some of them today at a family birthday party. I might take them a few homegrown tomatoes to tease them. I need to run back out to my garden now. I just harvested some more tomatoes, beans, squash, okra, cucumbers, and peppers this morning and now need to make a sweep through to pull out the worst of the weeds and decide if that scrawny cucumber plant is worth trying to keep going and if I should remove the sweet corn, from which I harvested two whole ears of corn. I guess being flattened by one of our rain storms last week was too much for it to overcome. Sometimes when I am out in my garden, like today, I remember fondly the day you and several others actually came and visited me in 2011 and saw my garden. That was a dry summer and the garden wasn't in great shape, but you were kind enough to see the good bones of it, and said nice things about it. Thank you for that, and for being an inspiration to me as both a gardener and a writer. P.S. 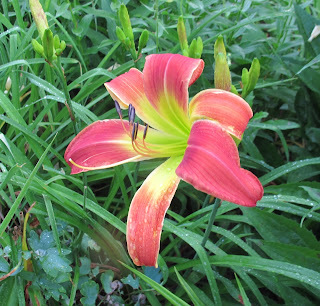 I've enclosed some pictures of more of my day lilies. I like those with an unusual form. I think this is one I've transplanted from my first garden, to my second garden, to this garden. Another one which is might actual be a spider type? I know this is the old, old variety 'Hyperion'. It has a nice subtle scent. And probably one of my favorites. It would be nice if I knew the name of it, wouldn't it? I love your daylilies. They are so easy. I don't remember the names of mine. I lost the tags ages ago. I love them, anyway! How very sweet of you to honor Dee like this, Carol. I think of her when I look at day lilies, too. (And for succulents my mind goes to Pam in Austin! :)) That last day lily is stunning! My fave of the bunch. Looks old, and Asian, doesn't it? I'm thinking, "Awwwww!" and getting a little choked up as I read your letters, Carol. Keep it going.